In 2016, the ACO Property Improvement Project accomplishments included substantial improvements to the gravel surface of our driveway and parking area, the addition of a lawn sign to increase visibility of our campus from the street, and the installation of a whole-house ductless air conditioning/heat pump system in our main building. All of these improvements have served to make the ACO property and building a welcoming venue for our on-site events and training classes. We are pleased that the improved gravel driveway surface held up very well through the winter, requiring only minimal maintenance in the spring of 2017. In addition, the new air conditioning system is working beautifully in the warmer early summer weather this year, keeping our event attendees, trainees and staff cool and comfortable. See photos. In 2015, the ACO Property Improvement Project has continued to make significant progress with improvement to our property. Enjoy the photos below and read about the ongoing rationale, progress and financial status of the project which have been spelled out in detail in our 2015 Summer Update and Appeal letter. Our Property Improvement Project (PIP) has been going strong and the hard work continues to beautify the ACO’s Princeton campus. We’ve now completed more than 90% of Phase-I that entailed clearing the property of “detractors.” By the end of 2014, we had completed the removal of 25+ years of brush, vine and tree overgrowth on the chain link fence bordering the full depth of our side yard. 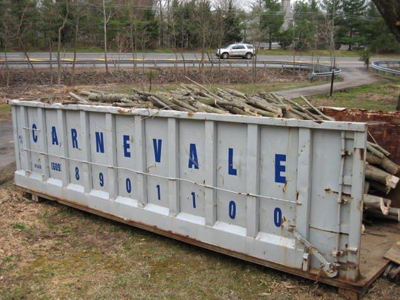 We also continue to cut and remove dead trees, vines, and branches as well as the remaining damaged trees from Hurricane Sandy and winter storms, and have gradually transformed areas that were previously impenetrable into grassy, usable lawn. Thanks to the hard work of our PIP volunteers, we kept the costs in check for this portion of the project using only $1,515 in PIP funding on contracted work. We also vastly improved the front of our property. Thanks to the tenacious efforts of our office staff and our PIP Project Manager, Jim Wittes, we were successful in getting the NJ Department of Transportation to dredge the congested brook that runs along the front of the property which resulted in an almost two foot reduction in the standing water level in the concrete culvert under our driveway entrance. As a result, this year’s rainstorms have caused minimal or no flooding at the lowest end of the driveway. Since this dredging was done by the State in a Wetlands location on our property, we saved an estimated $10,000 to $15,000, which would have otherwise been spent obtaining the necessary permits and hiring contractors to do this work for us. Additionally, for a less than $100, we updated our abandoned well drain-down maintenance by replacing the more vulnerable 300 ft. long thin corrugated 1-1/4” dia. plastic drainage pipe with a 1” dia. solid plastic pipe which discharges water from the sump pump installed at well bottom into the Rt. 27 drainage ditch at the lowest elevation corner of the property. Keeping the water level in the well to its lowest level just behind our building has taken a major load off the sump pumps in the basement. Aside from these more visible and tangible aspects, the majority of the remainder of the PIP work in 2014 occurred behind the scenes addressing foundational questions. Looking to the future, we obtained an up-to-date boundary survey of our land, and engaged a local engineer/surveyor to perform an updated topological survey, which includes the documentation of new land contours following the removal of the old swimming pool and its embankment. The flags from the recent delineation of the Wetlands and open waterway areas on our property were surveyed and that information was included in a fully updated property map. This assists us with obtaining government approval for property improvements that must conform to requirements relative to wetlands areas, flood zones and their respective buffer zones. The engineer also created a preliminary engineering layout of a new driveway and parking area on the Princeton side of our main building, along with a possible footprint for a new septic system and storm water diversion trench at the rear of the backyard. In 2014 we completed the renovations on our therapy evaluation room in time to see the first patients in our new Reduced Fee Referral Service for Young People. We also purchased new chairs for all of our public spaces: the presentation room, seminar room and board room. We have also continued to build our team of professionals by engaging a local land use attorney to help us with the legal aspects of our planned property improvements. He has already confirmed our zoning variance status setting the stage for future permit approval with the township. As we said last year, beyond markedly improving the appearance of our property, the whole point of our property improvement project is to have a safe and secure home for our core functions and to develop new activities to accomplish the goal of attracting and making better contact with new people. 2014 showed the immeasurable value of improving our property. In November, our ACO Movie Night completed its second full year, with three to four events a year held at our ACO campus. Movie Night continues to draw lively audiences of 15 to 20 people who engage in interesting, often entertaining, unique post-film discussions with various orgonomists. This year we also inaugurated a new course on sociopolitical orgonomy held at our ACO campus. Open to the public by application, the course began in September 2014 to an enthusiastic response from the full complement of 17 students. Attendance at ACO Movie Night and the new Sociopolitical Orgonomy Course prompted several supporters to contribute $2,000 to the cost of a new up-to-date, large-screen TV to improve the quality of the equipment in our presentation room for future movies and lectures. As we take care of foundational aspects of PIP we have taken time to engage in significant brainstorming on the best approaches to our improvements and in the process kept our PIP expenses to a minimum in 2014, totaling less than $5,000. 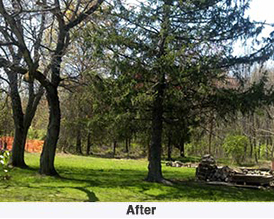 Since clearing the property more completely our perspective has broadened allowing us to see the property with new eyes as we described below in our Summer 2013 PIP update. Now as we take care of the foundational questions and deliberate about how best to undertake Phase-II—adding “attractors”—we need to raise the remaining approximately $160,000 of the nearly $260,000 required for the ambitious property improvement plans we announced in our last PIP-focused appeal in the summer of 2013. The College is committed to improving our property to make it a more suitable home for orgonomy. The Executive Committee continues to be enthusiastically behind our plans for the major foundational property improvements that we outlined in our 2013 Summer PIP Update below. We must establish a secure foothold in the world from which we can become an independent, self-sustaining presence to carry on our work, bring our gifts to the public and explore the vast continent of nature. We especially need your financial support to help us find those among the conventional thinkers with whom we can communicate and who may become interested in our work, more involved, even more invested. Building such a home for functional knowledge has been and will continue to be a huge undertaking, requiring generations. We need your continued financial support for the ACO to fulfill its most important core function of making a difference through the functional knowledge of orgonomy. To accomplish that we must create and sustain a home for functional knowledge and the programs that keep it alive. We need to develop our home that remains so unique in the world in support of the core functions of love, work and knowledge. If you would like to make a donation, you may do so by calling our office or donating securely online. You can also help us by volunteering your expertise, time, energy and materials. If you think you may have a profession, trade or skill or source of materials that can help us, or if you just want to get outdoors and do some good old fashioned yard work, please send us an email or call (732) 821-1144 and join the PIP team today! So much has happened in a relatively short time with our Property Improvement Project (PIP) that it is time to briefly review its history before detailing our current status and plans. 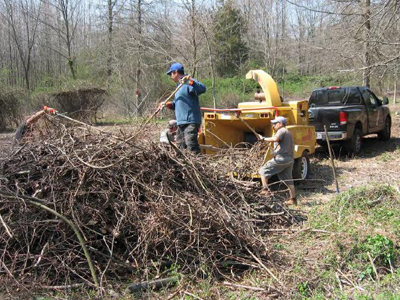 The PIP began on a small scale in the spring of 2011 with clearing brush and invasive overgrowth. 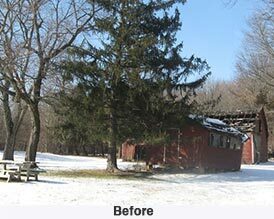 We then developed more comprehensive plans to remove the dilapidated outbuildings and other eyesores from the property. In December 2011 in our 2011 holiday appeal we publically introduced the project and its rationale for using our property to attract new people to our activities and orgonomy. We followed that introduction with a more complete description in our 2012 summer update in which we fundraised specifically for the project for the first time and laid out major components of the project. By the fall of 2012, except for refurbishing the pavement of our driveway/parking area, we had completed the vast majority of Phase I – the removal of "detractors" from the property with an estimated 100 tons of material removed from the property, including the dilapidated out-buildings, derelict swimming pool, several tons of brush and several more tons of downed trees in the aftermath of super-storm Sandy. The major remaining detractor to be addressed is the badly cracked and damaged paving of our driveway and parking area. We then began the more difficult process of investigating the best way to implement Phase II – the addition of improvements and "attractors." Much of this work, particularly early on, requiring wetlands delineation, hydrology and soil studies, surveys, permits and design work, was less obvious and visible but is equal in importance to Phase I. As outlined in the 2012 Holiday Appeal and Annual Report, tackling this part of the project requires major additions to the property that involve significant planning and expense to do them right. We were well into our work with various contractors to consider options for a workable and economical plan for the problematic driveway and parking area when we were interrupted by super-storm Sandy. Any further action on the PIP was delayed for several months as our focus turned to clearing the property of the wreckage from the devastation of the storm particularly the row of downed 60+ ft. spruce trees in the front yard and along the left side of the main building as described in our 2013 Storm Preparedness Appeal. Thanks to the extraordinary response to our recent Property Improvement Project fundraising appeal, I am pleased to announce we’ve raised $30,800 in contributions since mid July. What a great achievement in only two months’ time. 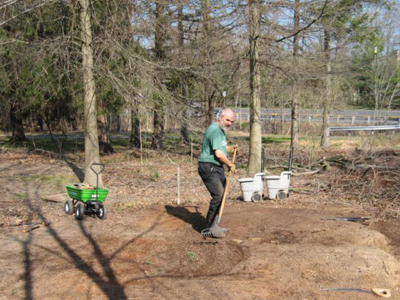 In addition, several new volunteers have stepped up to the plate, bringing our hard-working “grounds crew” number to 10. Those simple words, “There’s no place like home,” in the Wizard of Oz, had resonance for the nation in 1939 and still do these many years later. A central headquarters for the College as a home for ongoing work in orgonomy was the dream and vision of ACO founder, Dr. Elsworth Baker. This was a direct continuation of Wilhelm Reich’s dream that prompted him in 1942 to purchase and begin to develop the property in Rangeley, Maine that he called, “Orgonon.” Since its acquisition in 1986, the College's organizational home and central location have been very effective in helping us to organize, support and maintain our ongoing activities in all essential functions - training, publication, public education and research. had become a breeding ground for mosquitoes with its deck overgrown with poison ivy. We also installed a new concrete wellhead cover to replace the crumbling and potentially dangerous one that was on the hand-dug well of the original farm, situated right by the entrance to our building. In addition we updated some electrical work and completed hydrology studies to evaluate how to improve much needed drainage. All of this was accomplished by June 2012 with only $29,000 by keeping costs down everywhere possible by researching and negotiating with contractors, and through the efforts of our hard-working volunteer team. When you consider that this type of work normally would cost upwards of $75,000, we have really achieved a great deal with our limited funds. We also defined a general esthetic for the impression we want to create when anyone comes to our “home.” We now call the property a “campus” to convey a sense of creativity as well as professionalism. We want the outside grounds to have a variety of areas and have adopted the “savannah look” for the open but not barren feel we want for the already developed lower three acres of the property. 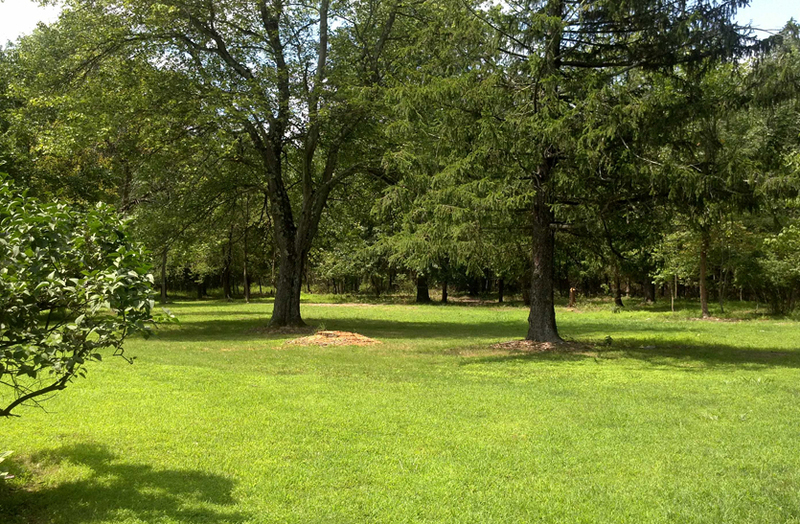 This general ambiance has trees but with an openness underneath allowing the eye to expand into the distance. More of the rationale for the PIP in general and specific thinking about the next parts of our plans in Phase II have been spelled out in the President’s 2012 Summer Appeal and Report. By summer 2012 we entered Phase II which is far more open-ended and in which the possibilities for investing in improvements is practically unlimited. Some of the work that still needs to be done includes a down-to-the-subsurface refurbishing of the driveway and parking area, much needed drainage, installing a professional-looking campus sign, improving and beautifying the property, creating usable outdoor spaces and updating the main building façade. * Must be completed first to allow time sequencing of driveway improvements. ** The possible cost of landscaping materials including trees, shrubs, perennials plus soil and amendments is almost unlimited. This estimate is minimal with the plan that much of the work will be done by volunteers. *** Construction to wait until some months after drainage project. Funds likely not needed until summer 2013. In order to keep things moving along we need your continued financial support. If you would like to make a donation, you may do so by calling our office or donating securely online. You can also help us by volunteering your expertise, time, energy and materials. More specifically, we can use help with engineering and architectural knowledge, land use planning and legal advice, excavating and drainage work, using quarry stone, landscaping, lighting design, lighting fixtures and electrical work. If you think you may have a profession, trade or skill or source of materials that can help us, or if you just want to get outdoors and do some good old fashioned yard work, please send us an email or call (732) 821-1144 and join the PIP team today! 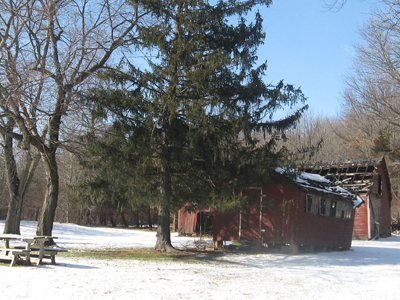 The College's backyard area with two of the five dilapidated old farm structures in need of removal - January 2012. 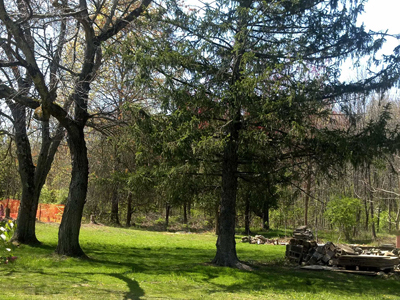 Our beautiful backyard in early spring 2012 with old structures removed! Brush growth being removed from the perimeter of the property - March 2012.